Welcome to my Garden Romp Crochet Along 2017 Part 2! Over the last week a lot of people have been asking how to sign up. There is no sign up option but there are a few ways you can share your work..
HOW TO SHARE YOUR WORK..
Use the button below to go see everyones projects so far! FACEBOOK: If you haven't yet, join my facebook crochet group. I have a weekly Q & A for the crochet along. If you're stuck or need some help, this is the place to find it. HASHTAGS:. Use the hashtag #debisgardenromp on any of your favourite social media sites listed below. Let's get started on part 2! 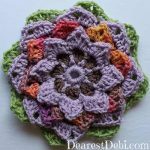 Garden Romp Crochet Along 2017 Part 2..
Garden Romp Crochet Along 2017 Part 1 Video Tutorial..
Have you made your own Garden Romp Crochet Along 2017 Part 2? "Hook Up" on Ravelry and share your pictures, I can't wait to see! I wrote an earlier comment asking if pattern was available in pdf form…I just found on Ravelry – THANK YOU! and bought it. I’m so relieved! Not because I don’t want to support designers, but I usually have to go for free patterns – since I live on Retirement income which is not particularly “generous.” But it is a relief to find this – and saves me a lot of time copying, pasting and then re-formatting for Word…. Now I have it all printed out! THANK YOU for doing that! Next step is to go through my rather large stash and see what I can use from that first…and decide on final color palette. You left column for personal color chart that makes this SO EASY! thank you again! Love your work…thank you for sharing so much. It’s inspiring to so many to see you – and others, of course, who share so much with the rest of us who don’t have the talent and experience that you do! Just so you know, it IS SO APPRECIATED!